BSL6 - Ladder Tours, Nation Wars & Map pool ! What can be more warming in January than some quality BroodWar content? Make yourself comfortable in your armchair – we are ready to launch the bombs! Map veto system remains the same from Season 5. Some people don't pick new maps because of lack of practice,that's why we are announcing three BSL tournaments, on three “newest” maps from Season 6. 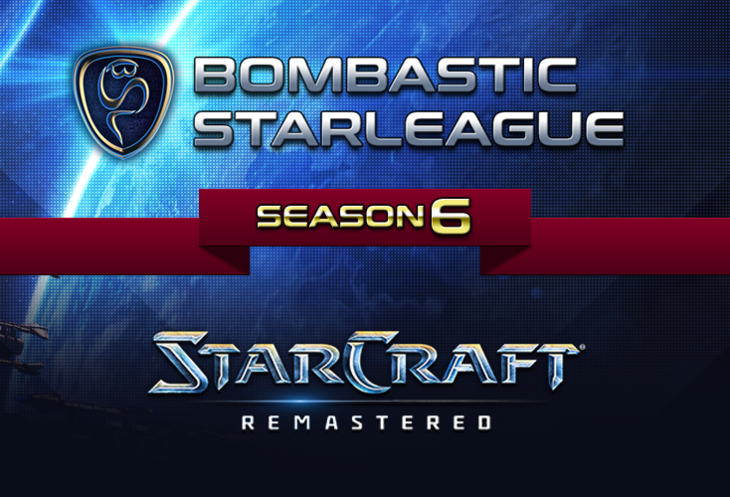 - On January 15th we will pick top5 players of each country from BSL6 Ladder Stage. - We will count their average MMR (countries that don't have enough players will be grouped in bigger formations geographically). - TOP FOUR highest rated countries qualify for BSL Nation Wars. - Tournament will be streamed on Sunday, January 20th. - Highest rated player on a team is a captain and he picks players for each match. - 3x 1v1 + 1x 2v2 + ACE - if needed. - One of 2v2 players MUST be person from TOP5 ladder in current country, second player might be lower ranked 1v1 player, but MUST have registered BSL6 Account with at least 5 games on it. - Prize pool for the winning team will be funded by donations during Ladder Tournaments. We want to test this format - for future Nation Wars - please be open minded and understandable. How you can start playing in BSL6 ? Don't hesitate to ask questions - if u dont understand format, rules or way of participation in ladder stage, We'll try to answer the questions in comments ! Edit: With what country(-ies) will Lithuania be grouped with? I love Nation Wars! So great News! Arew, it will depend on how many players neighbour countries will have on January 15th. do you imagine Germany will get an own team? Cryoc, Bakuryu, Favorit, Kuh +1 maybe? I think from your list only Cryoc plays ladder at the moment. But I hope that Nation Wars project will boost ladder activity. That sounds good, thanks for the explanation! 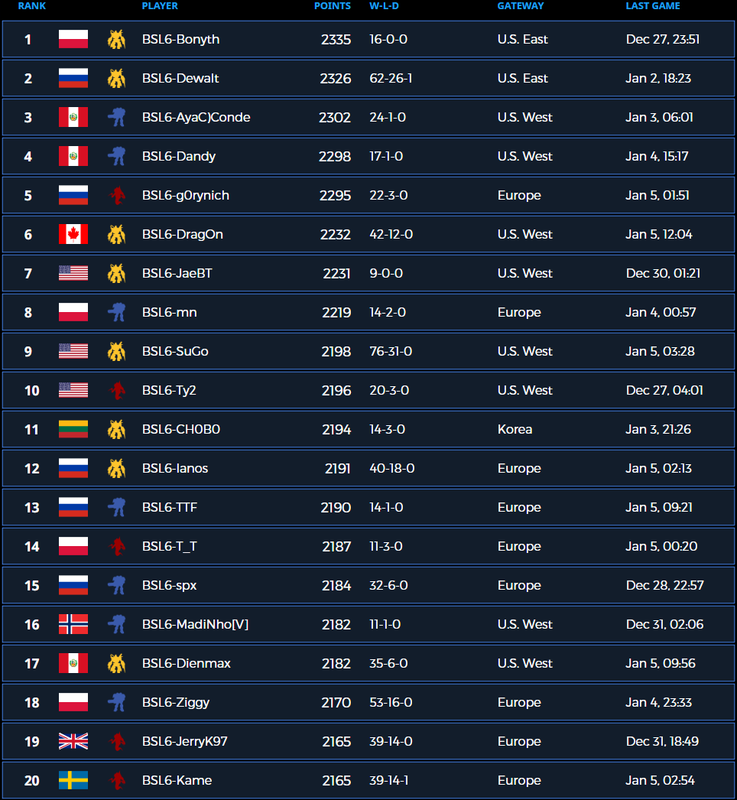 Well I’ll be representing usa if I’m high enough mmr, def won’t be though by these deadlines lol. Players who would advance to Proleague, if ladder stage would ends now ! For nation war, could we combine USA and CAN? Canada currently has exactly five players, so no need to combine. But beside that, we will put together teams that don't have five players. Closest country to Canada is Mexico in this case. Question, I made BLS6-G5 and tried signing myself up on the ladder multiple times but don't see myself on the rankings still. Can someone help me with this please? List of players is updated once in a day and only shows players that played their 5 placements games.